Lift out the piston, pulling it straight up so as not to bend the needle in its base. Note that on the diaphragm edge there is a tab that fits into a slot in its seating on the chamber base. Be sure to fit the new diaphragm the right way round and the right way up. There is a tab on its inner edge that fits into a recess in the piston. Pull the adjuster stop straight off. Before removing the float chamber, pull the adjuster stop off the jet with pliers. Note that emission-control models (See Adjusting an emission-control carburettor) do not have such a stop. This type has to be levered off with a screwdriver - take care not to scratch the carburettor body. Older models have a pin that you can usually remove with your fingers. If it is stiff, gently prise it out sideways with a thin screwdriver. Emission-control models have a pin set in clips: lever it out carefully with a screwdriver. The float needle valve is screwed into the base of the float chamber. It is in one piece and cannot be dismantled for cleaning. If it is worn it must be replaced. A float is maladjusted, or is leaking so that it no longer floats properly, causes persistent flooding of the carburettor. Fitting a thinner or thicker washer under the valve will alter its height and that of the float. Adjust the float by bending the tag that touches tho needle valve, or by fitting a thicker or thinner washer under the valve. 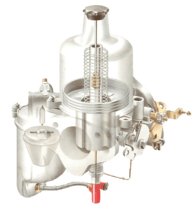 Do not remove the jet of an emission-control model (See Adjusting an emission-control carburettor): a special adjusting tool is needed for its castellated adjuster nut. Do not even turn it: this alters the mixture. Clean it in place by washing with clean petrol; blow it clear with a foot pump. Remove a conventional jet by unscrewing the holder, using a spanner on the lower of the two hexagonal parts. Do not move the jet-adjusting screw, as this will alter the mixture (See Adjusting a Stromberg carburettor). With the holder removed, pull out the jet. Lever off the ring with a pin or thin screwdriver; take care not to scratch the surface. Roll the new ring on over the holder. After reassembling the carburettor, centralise the jet (See Adjusting a Stromberg carburettor) if necessary.